The era spawning from the 1950s throughout the 1980s can be considered the golden era of telecommunication. While computers were expanding from items consuming entire rooms to something that could fit on a person’s desk, so was the way we communicate. Televisions went from being a luxury item to being in every home. Telephone systems were not only used for voice, but to transfer data from one location to another almost instantaneously. The inventions and innovations from this period have led to technologies we rely on every day: the internet, satellite television, fiber-optics, cell phones, and et cetera. But it’s often forgotten how we’ve arrived where we are. The AT&T Long Lines system is one of the systems that transformed communication systems but is nearly forgotten about. Without relying on vulnerable, expensive, and high-maintenance wired systems in a time where satellite communications and fiber optics did not exist, the Long Lines system allowed people to connect from all over the country. I grew up in rural Missouri between two small towns named Arrow Rock and Slater. For many, many miles all you would see on both sides of the road were fields of corn or soybeans. One thing that struck my eyes was a huge tower on one of the roads we frequented to travel to Slater – a small town of less than a thousand people. In the middle of a field, although located just off the road, was this giant tower. Painted red and white, at the top of this tower were four huge horn antennas – piercing like eyes watching you drive down the road. Being a kid who was interested in electronics and how they worked – including RF systems, I was mesmerized by the size of the tower and the horn antennas. At the base of the tower was a small white concrete building with a small gravel driveway leading to it. One thing that still interests me is how this tower had no light. Almost every tower I’ve seen to that point – and since – has had a light on the top of warn airplanes of its existence. This tower was tall enough (at least to my knowledge) to require some type of light, and especially since it was located in a field with no tall buildings or objects surrounding (or anywhere near) the tower. This tower was abandoned, and its purpose was unknown to me then and for many years after that. Over the years I’ve located at least three other towers of nearly identical design. One was much, much bigger and actually had a light. I noticed that all of these towers appeared to be abandoned. The towers had a very different design from any cell tower I’ve seen before, and didn’t appear to be used for radio or TV transmissions, either. Since horn antennas are highly directional, I knew that it had to have a more specific purpose. But yet I didn’t find out about their purpose until earlier this week. These towers were all parts of the AT&T Long Lines system. Throughout the hey-days of telephone and telegraph systems, wired systems were the only option. Long lines of cable connected cities together, although this system presented major issues. The first was vulnerability. Much like power lines and present above-ground cable systems, a tree limb or storm could easily knock down the cables. This isn’t a major problem when ten or twenty people are affected, but when hundreds of thousands of people are affected – including vital operations, it grows into a catastrophe. AT&T – a part of the Bell System – got a smart idea to replace these lines with something more reliable: a network of relay towers that worked on microwave frequency. The first coast-to-coast telephone call was made on August 17, 1951 using the Long Lines – sometimes known as the “Skyway” or “Telephone Skyway” – network. The system grew from it’s initial opening in 1951. Not only in the size of the network but the way it was used. 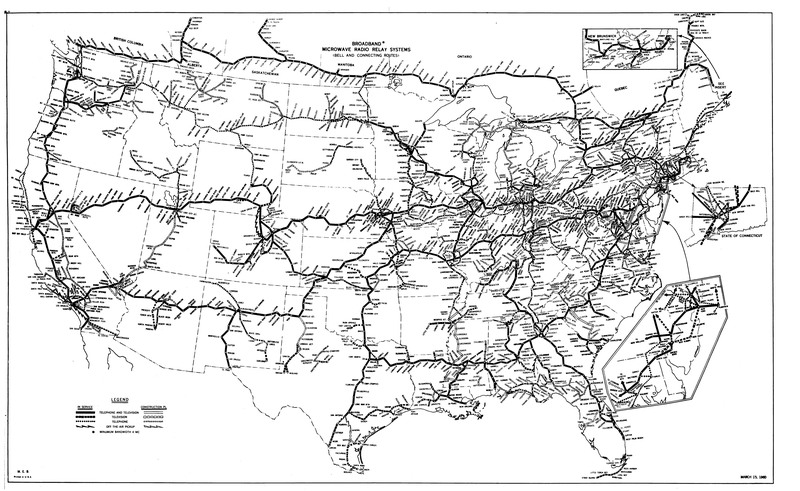 The Long Lines network was used to carry television signals, such as network television shows and news, as well as important military data. Computers would later utilize the network to transmit data from coast-to-coast with the advance of teleprocessing systems and modems. The stations were connected via line-of-sight horn antennas which transmitted (or received) microwave signals. A call placed in one part of the country would be passed on to the next relay station, then passed on to the next, and so on until it reached the station nearest its destination. Then it would be sent through cables to the telephone company then to your house. Each horn antenna was positioned so it made a direct path (line-of-sight path, or “as the eagle flies” path) to the next station. A call placed in St. Louis, Missouri but meant to be received in Kansas City, Missouri would have passed through the Slater station that I recall seeing as a child. Remember that I mentioned television? The towers were not only used to relay the transmission of telephone data, but also television shows. NBC, CBS, and other networks used this to air their shows and news networks all around the country. Some of the shows transmitted through the Long Lines system included American Bandstand and Monday Night Football, although the earliest example was used in 1951 to show Edward Murrow’s See It Now. During the height of the Cold War, the importance of the Long Line towers grew. Military phone calls and data were transmitted through the towers. Many towers had their base stations installed underground in shielded rooms that were tested to withstand the EMP produced by a nuclear blast. These underground stations also were equipped with the same toiletries and survival kits and items that many Fallout Shelters had. The towers themselves, with the horn antennas, were also designed to withstand a nuclear detonation. Some above-ground stations also were designed with sophisticated systems to keep the network online in the event of an attack. IBM had even used the system for confidential purposes in Kingston, New York. During the 1970s, technological breakthroughs eventually would spell the end for the Long Lines system. One of the new innovations was the use of fiber optics. Fiber optic lines are typically located underground, eliminating the vulnerabilities of earlier coaxial-based cable systems. Fiber optics also were much faster than coaxial-cable as fiber optic systems utilize light to transmit data through strands of transparent material that conduct the light, acting as a waveguide. The second innovation was the use of satellites themselves. Television programs could be relayed using satellites which orbited in our upper atmosphere, which allowed for widespread and nearly-instantaneous relays that required minimal equipment. And since the relaying equipment wasn’t on the ground in the middle of a corn field in Missouri, it was less prone to damaging storms and vandalism. But these innovations came at a time where AT&T – or the Bell system – was feeling the effects of poor business practices. The Department of Justice was hot on their case and eager to enforce antitrust suits against the company. The Bell system had developed a huge monopoly which allowed them to charge whatever they wanted for telephone lines. In 1982, the Department of Justice broke up AT&T – one of the largest monopolies ever created – to many, smaller telephone companies nicknamed “Baby Bells.” These “Baby Bells”, like Southwestern Bell and Bell Atlantic, would eventually evolve into many well known telecommunications company of today, like Verizon, CenturyLink, and (the modern) AT&T. Following the decision and shrinking of AT&T came competitors (mainly Baby Bells) who instituted the new innovations. Fiber optics and satellite systems quickly became the norm, placing the Long Lines system by the wayside. By the early 1990s, AT&T – now faced with competitors – decided the Long Lines system had served a long, faithful life and it was time to stick a nail in the coffin. And just like that, the Long Lines system faded from being state-of-the art technology to just abandoned towers and buildings. Thus, ending the often forgotten chapter in telecommunications history about the Long Lines system. Post-break up AT&T was not a small company for long. They eventually regained power by becoming one of the “big three” wireless (cell phone) carriers. 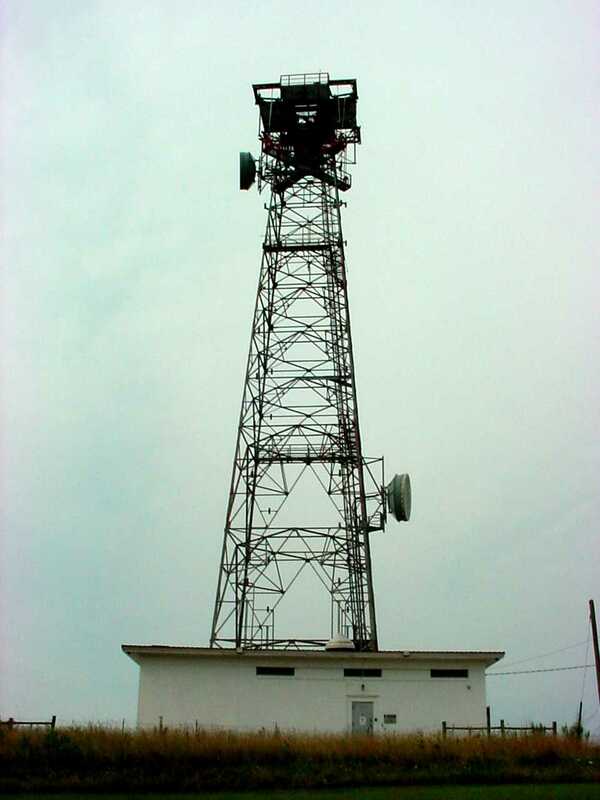 Once again, towers (although this time connecting cell phones) have been constructed around the nation, sometimes even in rural areas. Many of the Long Line towers remain as a reminder of how far we’ve come in the world of telecommunications. We have went from party lines and operators (“Betty, can you connect me to Mr. Smith’s office?”) to holding a telephone and computer – combined – in our own hand. We don’t need to stand by the phone to make a call or wait for one – we can do it all from hour hands, from virtually anywhere. The towers can also be used to remind you of the Cold War. Just like old airplanes, nuclear missile silos, or SAGE, the Long Lines system was one of the first lines of defense during a time where we were constantly under threat. As for the towers themselves – some have been reduced to scrap, some lay abandoned, others have been re-purposed. All of the Long Line towers I’ve seen in person (like the Slater station) have sat abandoned since the early 1990s. The base stations are surrounded by weeds and trash, while the horns have been weathered and damaged. Some of the stations have had their horn antennas entirely removed. One near where I currently live has been stripped of all its horn antennas, leaving just a flat platform with four holes where the horn antennas and their waveguides would have once went. According to Google Maps the Slater station has seen a familiar fate – having its horns removed since I last drove by that station nearly ten years ago. Other stations have seen a new lease on life. After AT&T sold many of the antennas to companies in the late 1990s, many have been re-purposed for other purposes. Many have been turned into ham radio stations, with the tower serving as a giant ham radio antenna. Others, mostly owned by one company (American Tower), have been leased to cell carriers (like AT&T and Sprint) to be fitted with cell phone relay equipment. Special thanks goes out to Spencer Harding for allowing me the use of his photos. If you found this entry interesting, check out his book: The Long Lines. Previous Previous post: Why keep the Pinnacle?